Lake St Clair Bass Bumper Crop 2018-"The Kimmel Effect!" At the Ultimate Bass Clinic at the Ultimate Fishing Show Detroit 2018, I asked Dan Kimmel this question. We could probably stop the bass season right now, and call it the best that we have seen in several years. To date, anglers seem to be catching more smallmouth in a wide variety of size classifications. It’s not just local anglers, but so many who have come up from Ohio, Indiana, Kentucky and other states, have found some easy fishing. 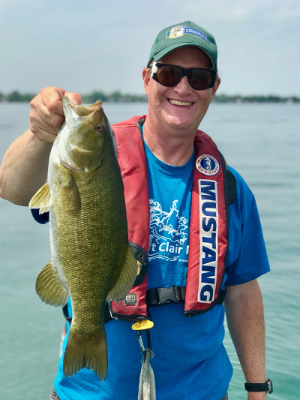 If you have been fishing Lake St. Clair for smallmouth bass for the last few years, the absence of smaller bass has been noticeable. A typical comment from out of state anglers has been, “I caught a few really big smallmouth, but that was it.” All that has changed. Spirits are running high about the quality bass fishing on this body of water, but other than the higher water levels, what has changed? In April of 2015, the regulations were changed to include a year-round “catch and immediate release” season for largemouth and smallmouth bass in Michigan. 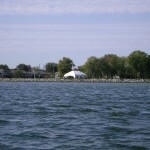 The linked article (above) contains a short list of organizations and methods that made that happen but left out the person who coordinated the entire effort…Dan Kimmel (www.greatlakesbass.com). It took two years of meetings, speeches and even testifying before the Michigan House of Representatives to have the regulations changed. Through scientific proofs, Dan managed to bring a broad coalition of top-shelf organizations together like MUCC, Michigan B.A.S.S. Nation, NRC, DNR representatives and more. 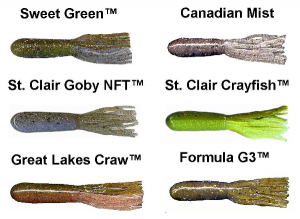 In many cases, Dan gave speeches or presented data to these groups who in turn developed resolutions in favor of “catch and immediate release” for bass. Dan, in turn, represented bass anglers in Michigan before the Natural Resource Commission and the House, and here we are. I caught up with a couple of guys getting off of the water at Harley Ensign. In spite of the wind, and the cold, they managed to boat 80 bass. The bite is on! NEW REPORT: “I’m halfway through my LSC trip this year and it’s been epic to say the least… I had 27lb 12oz for my best 5 smallies yesterday! My buddy and I had a 100+ fish day yesterday and Thursday. We were tossing back 3lb – 4lb like they were trash fish! I’ve caught two 6lb+ so far! Got 4 days left, hopefully, I can run into a 7lb+!”In the last 5 days I’ve caught 17 smallies between 5lb – 6lb 2oz!!! May 1: On and my second cast nailed the biggest smallmouth of my life! It was so big when I netted it I thought it was a carp. And I’m thinking why did a carp hit my crankbait? What the heck?? But then I’m like there’s no way that’s a carp this is a massive Smallmouth! Everything I’ve worked so hard for (all day) has come together in one single fish! May 31: (Paper tournament) Lead boat had over 300 ounces for their largest 5 fish. 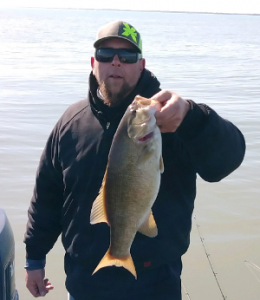 They reported they drifted 7.5 FOW and had a 21.5″ smallie. June 1: I had 19.75, 18.625, 18.25, 18.25 inchers by 9:30 and my partner had a 19″ and 18″ also by that time. 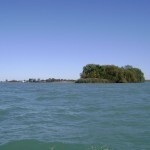 The positive reports are too numerous to mention them all, but what is clear is that Lake St. Clair is providing bass anglers with a unique opportunity: To have some of the best bass fishing trips of their lifetimes. The regular season, “catch and keep” and tournaments start this Saturday, June 16, 2018. If trends stay true to what we see in the environment, 2019 should be even better!